If we lived in an alternate universe where failure online was outlawed – with jails for bloggers, freelancers, and digital marketers – I bet those who neglect the power of keyword research would get a life sentence without parole. While the reality is considerably more benign, I have immense respect for the role search phrases play in SEO. By developing a strong keyword strategy, you equip yourself with a time-tested and viciously effective tool that has countless applications: driving traffic, landing high-quality clients, boosting profits through the roof, reducing advertising spend, creating passive income streams, link building, content marketing, you name it. Conversely, if used wrong, the tool bears a painful resemblance to the reverse Midas touch, turning everything you do into ruin and undermining every single step you take. It’s common knowledge that these and many other marketing-related issues can be partially or fully resolved with the help of a solid keyword strategy. Yet, a great deal of folks still underestimate – or completely ignore – the value it brings to the table. 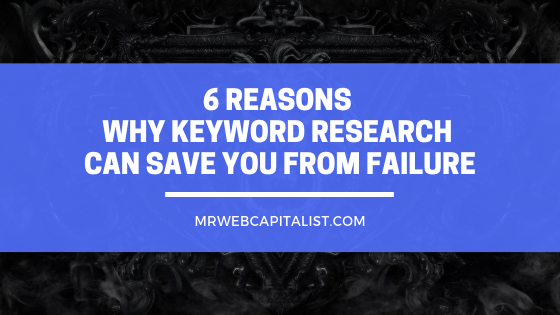 In this post, I will outline six reasons why the keywords you use can make the difference between success and failure online. If you’re not familiar with the term “keyword research,” here’s a brief definition to fill you in. Put simply, it means the practice of collecting the words or phrases users type into search engines, processing them, and using them for marketing purposes. Even though conducting deep keyword research can be an excruciatingly boring and monotonous ordeal capable of driving even the most seasoned digital marketers and routine-lovers to quiet desperation, it is still well worth every minute you spend on it. And here’s why. Starting out online without developing a keyword strategy is pretty much like throwing darts in a pitch-black room at a target that only maybe exists. According to CB Insights, 42% of startups end up in failure due to the inability to find a product-market fit before running out of cash. However, with some research and minor time investments, you can easily dodge the bullet and save the thousands of dollars that would have been spent in vain attempts to resuscitate something that was doomed to failure from the very beginning. Since keyword research provides you with data on how many people are searching for something every month, it is essentially a fail-safe method for answering the two key questions you must ask yourself before launching anything online: (1) Is there a market? and (2) What’s the size of my market? That way, you get a roadmap to your target market and collect enough data to make the best educated guess on whether or not you should dip your toes in even before you start pouring massive resources into your business. Moreover, the collected data will help you unveil untapped opportunities and unearth creative ideas to get you ahead of the competition – provided you conduct keyword research properly. It’s as easy as ABC: a solid keyword strategy promotes growing stable, steady, and, more importantly, free organic search traffic flowing to your website constantly. Having the highest conversion and engagement rate – e.g., users voluntarily typing into Google “buy a vacuum cleaner” are more likely to make a purchase – and no fees involved, organic search traffic naturally attracts intense competition you need to crush before driving any visitors. If facing stiff rivalry doesn’t sound appealing to you, just follow a simple rule: When it comes to getting premium-quality traffic without substantial costs associated with muscling out your competitors, you have to prioritize writing content based on untapped, high-volume keywords. And the deeper you dig while doing your research, the more search phrases like these you’ll find. In addition, knowing that 50% of search queries are four words or longer, you can play it smart and focus on collecting long-tail search terms to get highly convertible leads and meet little to no competition at all. Let me make something clear for you: liquidizing your assets and buying lottery tickets with all that money is a more sound business decision than advertising with pay-per-click (PPC) ad networks – Google Adwords, Bing Ads, etc. – without exhaustive keyword research. I mean, at least you’ll have some fun along the way while throwing money down the drain. Here’s an example: let’s imagine that you’ve recently started a brand new company selling bicycles across the US and decide to launch a three-month PPC ad campaign. This fresh screenshot taken from the Google AdWords keyword planner clearly shows the correlation between the keyword specificity and the average cost per click (CPC). In other words, the more you narrow down your search phrases, the less money you pay for ads and the higher the quality of traffic you get. In our case, if you opted for the generic keyword “beach cruiser” while developing your content strategy, you would end up paying almost twice as much, in fact, for less convertible traffic. This simple illustration demonstrates how many small business owners waste their entire ad budgets in no time – and wind up being broke with no sales. Be smarter and avoid falling for the trap that might put you out of business. Remember, traffic means nothing if it can’t be converted into sales or clients. I suggest you take the opposite approach. Even though specific keywords give only small drops of traffic, by collecting and using hundreds of them in your ad campaign, you make it possible to drive high-quality ad traffic for a tiny fraction of what you would have paid for the same result. Here’s something more you’d be better off knowing about. When it comes to advertising in Google AdWords – the largest PPC ad network – another major factor that affects your ads cost is your Quality Score, a metrics that show how relevant your ads are to your target prospects’ needs and expectations. High Quality Score leads to a lower CPC for your ads and better ad positions. In other words, the more accurate your keywords are tailored to your ads and landing pages, the less you’ll pay. How bad can it get? Ads with high Quality Score can save you up to 50% of the ad budget. But on the flip side, you may find yourself being overcharged by 25% to 400% as a direct result of a low Quality Score. The dream of chilling on the beach while making zillions of dollars online draws people like moths to flames. So what does keyword research have to do with generating passive income? Simply put, if you’re playing the long game, you should prioritize creating content around search terms that meet as little competition as possible to secure a constant flow of new traffic to your website, even months after you’ve long forgotten about its existence. If the answer is no, reconsider using the keyword. Realistically, in order to make the passive income dream a reality, you should rank for low-traffic keywords that can withstand the test of time rather than high-traffic search phrases that are constantly being targeted by your competitors. Using the time-tested long-tail SEO strategy, as opposed to gimmicks and the “hottest” tips, can help you spot profit-driving search phrases with no competition that will keep driving traffic to your website for years. An online business heavily relying on ad traffic is pretty much like a drug addict dependent on a substance – you know you’re in trouble the moment you run out of money. To prevent this from happening and ensure that temporary cash flow problems will not sink your entire business, you should work on getting organic, free visitors from search engines and social media platforms to cushion traffic drops when things get tough. And as I’ve mentioned before, a solid keyword strategy is paramount when it comes to doing that. There’s no two ways about it, keyword research must constitute the backbone of any content marketing strategy as it shows you what your target audience wants you to write for it. Otherwise, you risk wasting time and money on something that isn’t certain to bring you readers. Don’t fall for the trap of neglecting search phrases while developing your content strategy – it can bankrupt you to learn from mistakes the hard way. So there you have it. Keyword research can become an incredibly effective tool to grow your online business and get ahead of your competition, provided you know how to use it properly. Never underestimate its potential, and make sure you wring every last drop out of what it has to offer. If you liked this article then read [Guide] How to Increase Website Traffic in 2019. Do you have any questions? How did you like the article? Let me know by leaving a comment below right now! Max Desiak is an independent content marketing consultant and a B2B freelance writer focused on helping small and mid-sized businesses grow their online presence to win and retain customer loyalty.